Budget-friendly and packed with protein—pack during the week for lunch. Bring water to boil in a saucepan. Add rice, olive oil, and salt. Cover with a lid and reduce to a simmer. Simmer for 15 minutes, then remove from heat. Do not take the lid off at any time. Let the rice rest for another 15 minutes with the lid on at all times. 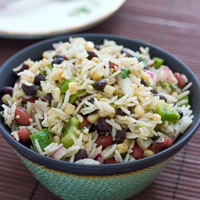 Add corn, red beans, black beans, green bell peppers, onions, garlic, cilantro, vinegar, oil, and cumin to a large mixing bowl. Mix well to combine. Add rice and mix. Add salt and pepper to taste. Serve at room temperature or chilled.